Download and hand off closed transactions to agents and others without waiting for monthly backups. 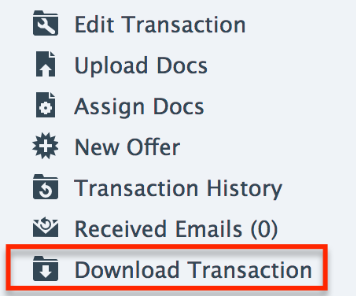 From the Transaction you’d like to download, click [Download Transaction] from the left menu. Confirm the download. You’ll receive an email with a link to your download within a few minutes. Click the link to complete the download of your transaction. In addition to being able to download individual transactions, monthly backups are included in your Paperless Pipeline plan and are automatically generated each month. This feature is only available to users that have the “Download company-wide backups” permission or are an admin of the transaction's location. The backup contains all data belonging to the transaction. So if an admin wants to hand a download off to an agent, they should remove appropriate documents from the backup first.